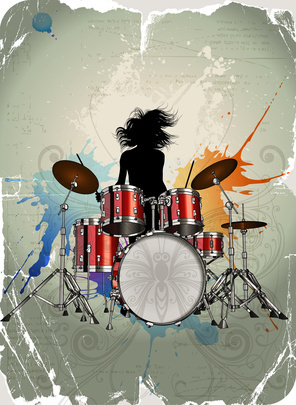 Drum wrap – The Best Drum Wrap Company now provides a wide variety of exciting drum wrap designs that can transform the appearance of any drum set into an eye catching, one of a kind kit. Over time, our drums literally take a beating. This is why we change the batter heads and the resonant heads. Making sure the lugs are lubricated is also an important part of maintaining a drum. But what about the shells? Exposure to sunlight, regular handling during setup and breakdown, loading and unloading, also takes it toll on the finish and the vibrancy of the color. At this point the question you have to ask is are you a purest and relish the original authentic appearance of your drums regardless if they look yellowed or faded, or are you ready to move ahead with an entirely new a custom look? A new set of drum wraps for a five piece kit is less than $250 and can be delivered to you within 2 weeks. When buying a drum wrap kit you’ll also most likely need new air vents. These are available in chrome, brass, white and black colors. An incredible collection of contemporary designs is available including wood, wood inlay, wood fade, skulls, abalone, lightning, flames, camouflage, cosmic, animal skins, racing, reptile skins, and water bubbles. If you are a drummer then you are already pretty handy with tools. To install a drum wrap, you’ll need a drum key to remove all of the lugs, a screw driver to remove the mounting brackets and any other attachments, a putty knife or razor blade to remove the badge, and a hammer to gently chisel off the existing grommet or air vent. You’ll also want to get four spring clamps to hold the drum wrap onto the shell as you install it to make certain everything stays in place. The key is to make it as tight as you can around the drum and then use the double sided tape to attached and secure the extra overlap to the starting point of the drum wrap. It’s also a good idea to make certain the original surface of the drum has been smoothed out as best as possible. And, make sure your seam is on the side of the drum that is facing the drummer, not the audience. You & Your Family Parenting Magazine Goes Live!